For the first time in U.S. history, marijuana breathalyzers were in use on public roads, and it’s happening right here in California. The devices, the brainchild of an Oakland emergency room doctor and reserve police officer for the Alameda County Sheriff’s Office, are expected to be distributed nationally sometime next year. 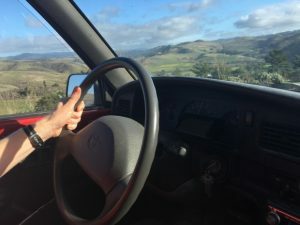 During initial field tests, drivers who were spotted driving in an erratic fashion were pulled over by Alameda sheriff’s deputies – including the creator of the device – who then and those drivers voluntarily agreed to breathe into the contraption. Two individuals admitted to smoking the drug within a half hour before the traffic stop, and their breathalyzer readouts were reportedly much higher than for the other drivers. In other drivers who admitted to using in the last three hours, the device also tested positive for the presence of THC. No one involved in the experiment was actually arrested, and officials say that wasn’t the goal – yet. Right now, they are in the testing phase to see how well it works. The sheriff’s office also said it wanted to educate those who were pulled over. Although there were no arrests made for marijuana impairment, those who tested positive were not allowed to continue driving and had to find another ride home. One drunk driver was arrested. If the device proves effective and becomes widely used, it could prove a game-changer. That’s because right now, there is really no scientifically accepted method of testing for a marijuana high. Blood tests can show whether a person has consumed marijuana, but because the active ingredient stays in the human body for so long, there is no way to ascertain when the drug was actually consumed – a major factor in proving intoxication. Frequent users of the drug – including L.A. medical marijuana patients – are going to test positive for high levels of THC in their blood, even if they aren’t actually impaired. Although none of the drivers stopped in this most round of testing had consumed edible marijuana recently, the creator of the device said it’s been tried on users who consumed both marijuana gummy bears and marijuana brownies, and was successful. It’s pretty well established that the high of edible marijuana is delayed, but it may be detectable on a person’s breath for a longer period of time. Still, these devices still need to undergo a fair amount of testing. The creator conceded the need for more laboratory tests confirming the accuracy of the device, particularly as it relates to the level of the drug detected on a person’s breath. Law enforcement agencies are being recruited to help the company collect data on the road to determine whether these devices are accurate and feasible for regular use. The devices will be sent out to six different departments over the next six months. Other companies are racing to come up with other kinds of technology. One proposal involves a fingertip sweat test. Our medical marijuana attorneys are skeptical. The technology is newer. It hasn’t been thoroughly tested. We’re talking about potentially depriving people of their lives and livelihoods on the basis of what is essentially still an experiment. If you have been arrested for marijuana DUI in L.A., we can help.